In the early 1980s, Land Rover embarked on a £200 million investment programme that quickly produced the Stage 1 Land Rover and the 4-door Range Rover. 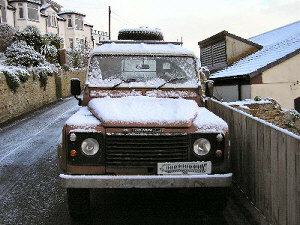 The programme finished with replacements for the Series 3 in the form of the 110" Land Rover in 1983, and the 90" Land Rover in 1984. The Series 3 remained in production until 1985. Externally, the 110 ("one-ten") resembled the Series 3. The general shape was retained, but there were a number of minor changes. The grille was moved forward, allowing sufficient space in the engine compartment for the Rover V8 as well as other engines. The windscreen was replaced with a taller one-piece windscreen, and polyurethane wheel arches were fitted. Inside, the furnishings were improved, and the slide windows were replaced with wind-up ones. The rear load space was increased by restricting the boxed-in sections to the wheel arches only. Leaf springs were finally replaced by coil spring suspension, and power-assisted steering was added as an option. The Series 3 4-cylinder engine options were increased to 2.5l, and the Rover V8 was added as a standard option. The four cylinder diesel was replaced with a turbo diesel engine option in 1986. 1984 saw the launch of the 90" ('Ninety'). The new name was partly a result of marketing. In reality the wheelbase is 4.5" longer than the 88" Series 3. New features of the 110" were carried over to the new 90". In 1985, the 127" was launched. Now known as the "130", the 127" is an even longer wheelbase version of the 110". Intended for the commercial market, this vehicle is ideal for special body conversions. With the 1990 model year the ninety and one-ten were re-branded 'Defender'. 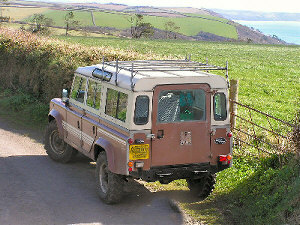 Defender also came with the 200TDi turbo diesel engine option, followed in 1993 by the 300TDi. In 1999, the TD5 5-cylinder turbo diesel engine option was added to the line-up. Despite the introduction of electronics with the TD5 engine, it is already proving itself as tough as any Land Rover engine. In recent years, a double cab version of the 110 pickup model has been released. Keeping the proven working vehicle of the original pickup, the extended cab can seat six people. 1984 110 County Station Wagon (brown) Photographs: © Mark Varley. Thanks also to Mark for some of the above information. 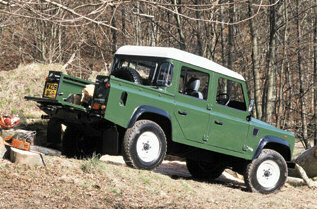 90, 127, and Double Cab Photographs: © Land Rover. Do NOT deep-link directly to individual images on this page: it will NOT work! Instead, you are welcome to link to this web page. This WILL work.